When I'm playing World of Warcraft, that's when I want to nosh. I don't do it when I sit in front of the TV. My hands are usually otherwise occupied. I'm cross-stitching, crocheting or petting a cat. Something about sitting down at the front of my computer with a beverage brings out the nosh monster. For one's health, however, this is not the best thing. That's why I tend not to have a lot of noshing foods in the house. I will eat them, all of them, in a couple sittings. Not good. I sent a friend some candy goodies for her birthday. She should be receiving the parcel today. I filled a rather silly container with her favorite and some other silly things, but I overestimated just how big the container was. The Runts I bought wouldn't fit. They have turned up next to the computer. Added to them were the rest of the Reese's Pieces that didn't fit in the container. 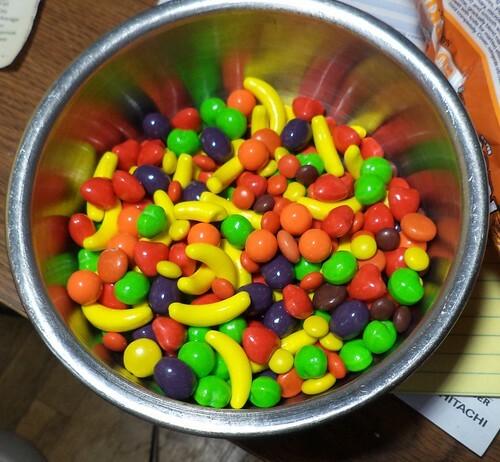 The nice thing about Runts is that I can't eat a lot of them in a sitting. The Reese's Pieces look a lot like the Runts so I'm not eating them by the handfuls. This is a satisfying mix to nosh on while playing the game. I saw these on the ThinkGeek.com web site, some time ago. I can get lost in those pages for hours. This probably doesn't look like anything spectacular but here these are out of the foil liners. 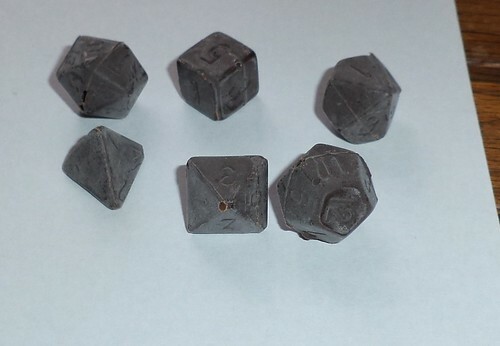 If you know gaming, you will recognize these shapes as being the dice commonly used in Dungeons and Dragons or other tabletop pen and paper fantasy games. I got Carole a set and, well, had to have one for myself, naturally. They are made out of dark chocolate, 60% dark Ghirardelli Chocolate, no less. This is the ultimate in noshing. 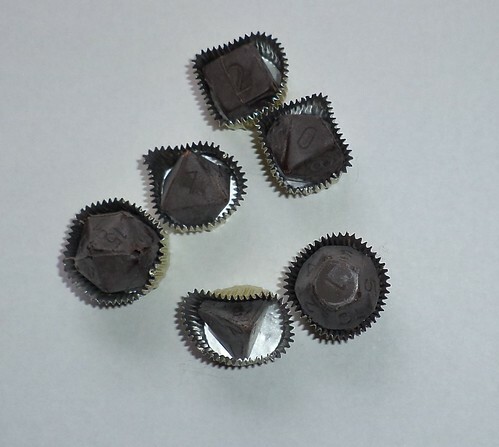 The problem is that, as much of a chocoholic as I am, 60% dark chocolate, while good for me, is rich and I don't sit down and consume that wantonly. I've eaten the 4 sided die and it took me a couple sittings to do it. It's good, oh it's good, but these really aren't the "pop in your mouth" kind of dark chocolate one consumes when one is playing a game. 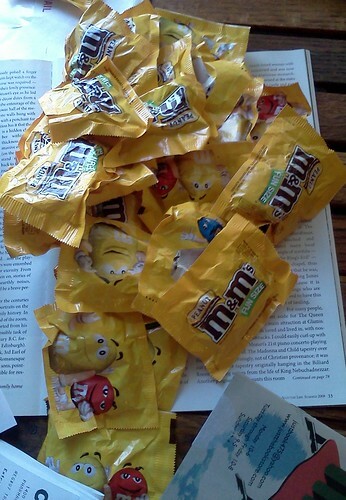 I discovered something else I would nosh a whole bag of, which also isn't a good thing. Oh my gosh are these good. 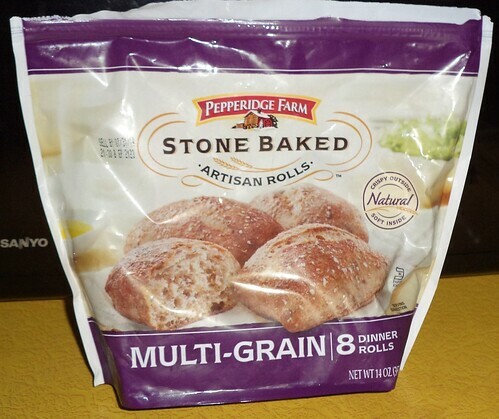 They are expensive; notice the package contains only 8 rolls. But fresh from the oven with a teaspoon of butter, they are heavenly. I can't keep these in the house. I'd make the whole package and that's all I'd eat some weekend. If you have more restraint than I, they get a huge thumbs up. I need to try them hot from the oven with jam, although that's not something I can eat in front of the computer. I did eat the last 3 rolls in the package while playing the game. I'm also willing to bet that they will be in scarce supply on Wednesday night next week. Yesterday, noshers of the world rejoiced, just a little. There was a report, published in the New England Journal of Medicine, which stated that people eating a handful of nuts daily had a 20% reduction in heart disease, cancer and type 2 diabetes. That's a significant reduction. It didn't matter the kind of nuts, either. One handful, once a day, was enough to lower risk. Nuts are almost the perfect noshing food, but they are high in calories so must be consumed in a small amount. A "handful" translates into an ounce or 1/4 cup. If you actually measure 1/4 cup of peanuts, it looks like a lot and if you eat them one at a time, you can make them last a long time. My friends know me quite well. Several of them sent me a link to the news reports of the study along with the comment, "The nuts you eat should be plain, not contained in the middle of M&M's." Dang. There's always a catch, isn't there? Not a fan of "catches " either! Sitting in front of the computer is dangerous here too.